Wonderful colours, a great picture. those colors are amazing. This could be hanging from any wall.v. Gorgeous scene, Buz. I could stare at this all day. V. Stunning!!! Absolutely stunning. You are a master with your camera work. The wonderful colours of autumn are coming through so beautifully in this wonderful scene, Buz. The light is so beautiful as well.V!! Just wonderful like an old painting masterpiece ! Light and colors are so beautiful....BV. A true masterpiece of a beautiful autumn scene. 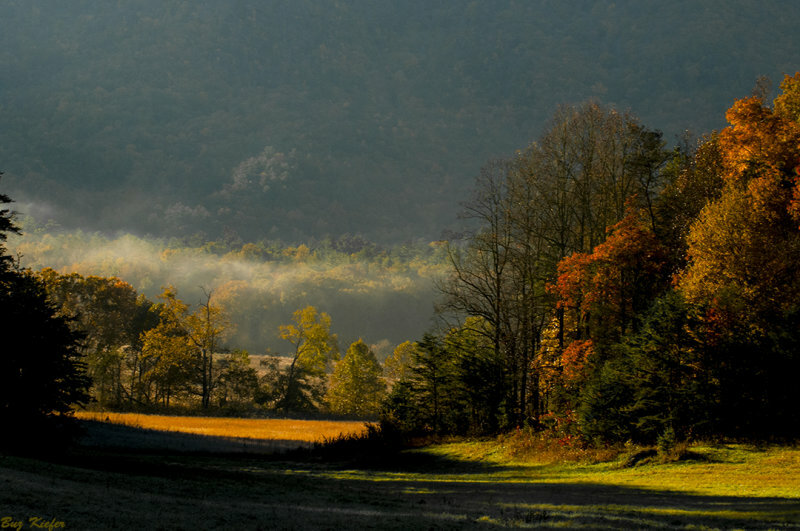 Stunning colors with the lengthening shadows of fall and low mist over the forest. Superb lighting. What a wonderful ambiance. "V"
Oh Buz this is beautiful. Neil is right. That is just what I thought when I saw it. Great light and colors in this scene. Like the touch of mist. Beautiful image. The light and contrasting colors are excellent. It has the feel of a 19th century painting. Lush color and defined light. "V"
The light is superb in this beautiful capture, which to me has a painterly feel. V.
Awesome capture, Buz. This is beautiful. Excellent frame, beautiful light. V.
Superb image showing the wonderful colours of nature. V.